I first discovered this verse in my twenties, at a time when I moved a lot. I wanted so much to respond to God as Abraham did, to trust God for the future unknown. That future turned out to contain a husband, children, and a home for decades in a comfortable, quiet suburb. I love my neighborhood, my house, my yard, my “let’s-get-together” neighbors. I have loved raising my family here. I could stay here forever. Perhaps I shall. Or perhaps God wants me to leave this comfortable place, this now empty-nest place. Perhaps He wants me to stretch. Perhaps He wants to show Himself faithful by leading me to unknown destinations. Ah . . . a clear voice. A distinct voice. An audible voice. The waiting and the listening for next steps challenges me. When will God direct? Where will He direct? How will He fit all the pieces together? Truthfully, staying put and sticking my fingers in my ears sounds much easier. A bit childish, perhaps, but safe. Abraham might have heard God speak, but He still had to place his confidence in that voice and act on what he heard. Somehow living by faith stretches me more now in empty nest than it did in my twenties. Perhaps I have come to depend on routines and the known comforts of life. Perhaps I have settled into a no-risk pattern of daily life. Perhaps I have taken my eyes off the One, the only ONE, who knows what the future will hold and tried instead to put together the puzzle on my own. Oh, may I, in this empty-nest season, learn to live by faith. May I remember that living by faith means trusting God when I don’t know the where or the why or the how. About the author: Afton Rorvik savors words, flavored coffee, time outside, and living connected. Although an introvert, she has come to realize that what really matters in life is people and faith in Jesus. 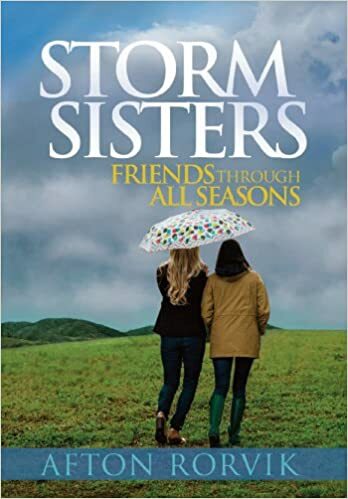 Afton’s book, Storm Sisters (Worthy), takes a story-filled approach to learning to stick around when storms hit a friend’s life. She blogs monthly at aftonrorvik.com and thoroughly enjoys Pinterest (Afton Rorvik). You can also find her on Facebook, Twitter, and Goodreads. Join the conversation: Has God asked you to trust Him and follow His lead? ‘Tis the season… for Christmas movies. I love them! Happy people, beautifully decorated houses and towns, and wishes that come true—what’s not to love? I watch and smile and go to bed happy with the phrase, “. . . that’s the magic of Christmas” rolling around in my head. And I want that magic. I want amazing things to happen in relationships and at work and in our broken world. I want to keep believing in the good and the possible and the miraculous. One morning recently I read some words that made me stop and think and remember that life with God is about so much more than getting what I want from Him: “God rewrote the text of my life when I opened the book of my heart to his eyes” (Psalm 18:4 MSG). Honestly, that phrase “opened the book of my heart to his eyes” makes me a bit uncomfortable. So personal. So honest. So very much NOT about asking God to do this or fix that for me. More about siting in the presence of God day after day and letting Him see all of me, then listening to what He teaches me. More of a long haul, a day-by-day, year-by-year process of transformation. Not quite as splashy or obvious as a quickly-granted wish. But, ultimately, what can compare to a transformed heart, a rewritten life? In this busy season of Christmas may we take the time each day to open our hearts to God, inviting Him to transform us. May we celebrate the gift of being known by the God of the universe, the God who loved us so much that He came in human form at Christmas. May we learn to let go of our wishes and rest in His loving presence. About the author: Afton Rorvik savors words, flavored coffee, time outside, and living connected. Although an introvert, she has come to realize that what really matters in life is people and faith in Jesus, which gives her the strength and courage to live connected. Afton wrote Storm Sisters (Worthy), a story-filled book about learning to stick around when storms hit a friend’s life. She blogs monthly at aftonrorvik.com and thoroughly enjoys Pinterest (Afton Rorvik). Join the conversation: How has God rewritten the book of your life? The package on my doorstep surprised me. I hadn’t ordered anything. No one in my household had a birthday. No national holiday loomed on the near horizon. And I hadn’t heard the doorbell ring. My dog hadn’t even barked. I ripped opened the squishy package and discovered a pillow with a large word written on it: GRATEFUL. Who could have sent this? I hunted and hunted for a card, but clearly someone had ordered this from a company and had it shipped to me. Was it the friend I helped out last week? Or the guests we housed last month? Although I wanted to send a thank you note, I sort of loved not knowing who sent the pillow because it caused me to evaluate my life over the past few weeks. Had I interacted with people in such a way as to make them grateful? Had I lived in a grateful state within my own heart—looking daily for God’s good gifts? I love this word: Grateful. I want it to stick to me like Velcro and follow me around like a love-me-please puppy. BUT gratitude takes effort. I naturally tend toward more of a glass-half-empty view of life—an Eeyore mentality. I can wallow in worry about what-ifs, isolate myself, criticize people in process who don’t respond to me the way I think they should, keep a list of all that seems upside-down in my life. . .
I’ve working to retrain my brain and heart by starting my days with worship. I sit in a cozy chair, turn on my playlist of worship songs, and open my hands to God. I let go of what weighs on me (often naming them specifically) and celebrate God’s good gift to me of Father-love as I let the music wash over me. How could I NOT live in gratitude when I live in the truth of these words and in the presence of the Father who does NOT change? After posting a photo of my mysterious gift on Facebook, I learned that it had come from a friend I first met when I was 13. We now live states away but have managed to stay connected all these years. What a delightful no-good-reason, just-for-the-fun-of-it gift! J But even more fabulous—what a gift of enduring friendship! This November my new pillow sits in our dining room window reminding me (and hopefully all who enter there) to remember the transforming power of this word: Grateful! Join the conversation: For what are you grateful this week of Thanksgiving?